On Friday, Iraqi TV reported that government forces killed Izzat Ibrahim al-Douri, Saddam Hussein's former deputy, in the Hamrin Mountains. Al-Douri was the highest-ranking member of Hussein's team to evade the U.S. military and has been a fugitive since the 2003 invasion. He hasn't just been hiding out in a cave since Hussein was executed in 2006 though — he's thought to have led a post-Hussein Sunni extremist group that later allied with ISIS. 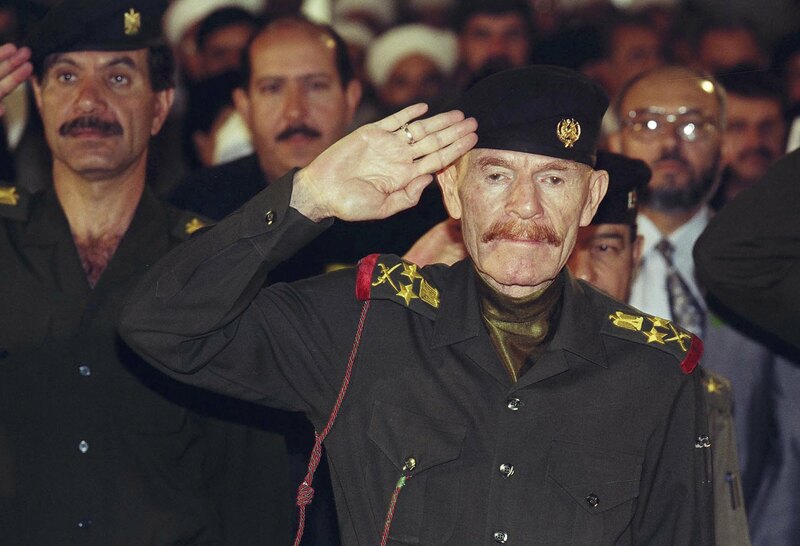 Iraqi TV said that the former military commander and vice chairman of Iraq's revolutionary command council during Hussein's presidency was killed in a security operation in the mountains of Iraq. According to NBC News, the government issued graphic photos of the corpse that showed a red beard and mustache (al-Douri's main identifier being his red mustache). "We are not 100 percent sure that the body belongs to Izzat al-Douri," an Iraqi security official told NBC. The body arrived in Baghdad Friday and DNA samples were taken to confirm that it is in fact al-Douri, but the results are not yet known. The Iraqi government has claimed to having stopped al-Douri before, circulating a photo of a man arrested with similar red facial hair in 2003, but it turned out to be the wrong man. Since Hussein was executed in 2006, al-Douri has layed low, but hasn't been completely inactive. In 2009, he broadcasted a message on Al-Jazeera television in which he urged his supporters to destroy the government of Prime Minister Nouri al-Maliki after the U.S. withdrew its troops, according to GlobalSecurity.org. A man claiming to be al-Douri released multiple videos in 2012 criticizing the Shiite-led Iraqi government at the time, according to CNN. The videos were posted on the 65th birthday of the Arab Socialist Baath Party, which paved the way for Hussein's Baath political party. "Everyone can hear the sounds of danger echoing daily and threatening the country," the man in the video says. Now 72, al-Douri is believed to have led the post-Hussein Sunni extremist group Naqshbandi Army, which supports ISIS. According to GlobalSecurity.org, in July 2014, an audio recording thought to be al-Douri's voice called on Iraqis to join the efforts to "liberate" the country and praised Sunni militants. The recording said: "The liberation of Baghdad is around the corner. Everyone should contribute, to the extent of his ability, to complete the liberation of the beloved country, because there is no honor or dignity without its liberation."